Thanks for joining the fun of the blog tour. 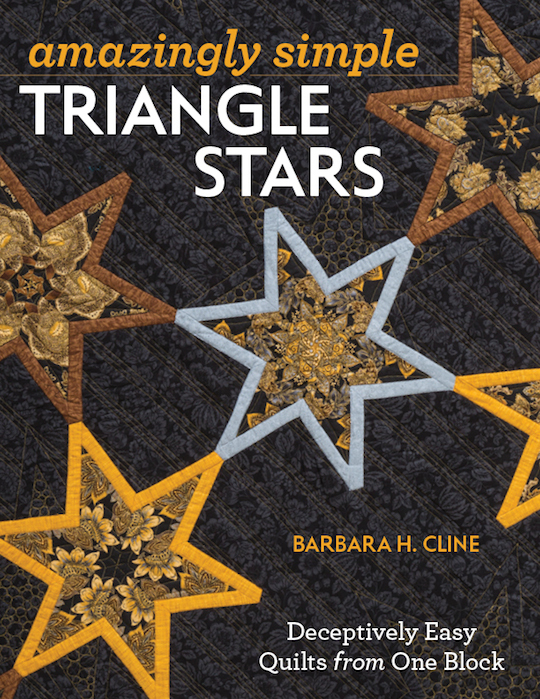 This is the last stop of the blog tour for Amazingly Simple Triangle Stars book. Here is a short video clip I want to share with you so you can see just how simple it is to piece this block which can make all the quilts in this book. To enter the drawing leave a comment and let me know if you see the 18 triangle blocks in the table runner below. Leave me an email address so I can contact you. I will be giving away a book and also the table runner pattern "Let's Party". This table runner is also made with the same triangle block. This quilt will be featured in the magazine Quiltmaker July/Aug. 2016. This tour is closed Sunday, May 8 midnight. Here is where you can purchase a signed copy of the book Amazingly Simple Triangle Stars. There is nothing so easy that it can't be made difficult....but I found all 18 after I remembered what the block looked like in the video. What a great block! Each star is made of triangles so neat. The quilting on each piece adds so much to the stars. Thank you for the video. After watching the video now I can see the individual blocks. I had a hard time finding them in the pictures of the finished quilts before. I love the many uses for it! I love the block. Thanks so much for sharing! Yes, 18 triangle blocks--the point of each star included in each one! What an interesting concept. This is such a clever block and I love the different quilt patterns! Yeap, but they are well hidden. Beautiful stars. Hi Barbara, I enjoyed the video! Your book/quilts are amazing. Yes, i think I found all 18. I'd love to win your book! I saw the block on another post on the blog hop, otherwise I doubt I could have figured it out. The book looks amazing! The block that this book covers is just BRILLIANT! Really hard to distinquish the triangles. You are clever. I do see the triangle blocks...this is a totally awesome eye trick...lol...love ur work! Hey, those triangles are well disguised! Another interesting design. I see the block but am so impresses with all the different looks it gives in your lovely quilts. I think I see the 18 triangles. Do you use rulers or templates? You are so clever to have developed one block, that can make so many different looking patterns. Thank you. Yes I do see the 18 triangles. I like how you made so many different looks from just one block and I absolutely love the red, white and blue table runner. Love the concept I found the 18 triangles! After seeing the video I had no problem finding all triangles, and I feel so eager to try some star-making of my own! thanks for being a great inspiration! Yes, I see them thanks to your bideo. Found the triangles. This book really got my attention, would love to win it. Thanks for the video and yes, I do see all of them. Would love to win a copy of your book. I do see the triangles, and I think your design is marvelous. Thank you for the chance. Rabbitcreekquilter at hotmail dot com. I watched the short clip and it all made sense but I found it too difficult to count on the runner, the pattern played havoc with my eyes. 6 points in each star, so 18 triangles! They are hard to see, though. Congratulations on devising such an intriguing patchwork unit. I can see where the blocks are, but your clever quilting has obscured the seam lines. I'd love to be able to make this design. Thank you for the opportunity to win a copy. So fun to see what you've created! I found the triangle unit in your table runner, and find it interesting how choice of fabric changes up that one unit. Congratulations. What a great block and so many different design ideas to choose from and carry on developing. I would love to win a copy! I *think* I see the blocks! I was surprised at the size of some of your quilts in the book. Not sure that I see the blocks! Very interesting pattern. Would sure like to give it a try. Wow - I only see the stars! Your technique is incredible and I can't wait to try it. I counted 18 points! What a fantastic star block! Loved your short video. It always helps me to actually see it done rather than try to figure out some of the directions, some times, anyway. I can see the blocks! Yes. 18. So love this idea! The blocks are well hidden; only seeing the stars. Thanks for the chance to win! Amazing method indeed. Thank you for a great talk at Fairfax QU recently. I would love to win the book. I really had to look to distinguish 18 blocks! I'm constantly amazed how different color/value combinations changes the look of the block! I love the possibilities this block has! The runner is amazing and had me stumped to find the 18 until I really looked closely! I love this pattern. I think the star pattern would make some very beautiful quilts of valor. Thanks for posting the demo. As soon as I saw this book my only thought was: "Let the magic begin":-). This is an amazing block! So hard to distinguish the individual blocks in the runner! I'd love to win a copy of your book but if I'm not that lucky, it's definitely going on my wish list! What a great technique. I think even I could make a tumbling block quilt with it. Love your stars!! It looks so simple to do but the results are amazing. Yep, I see 18. Love this look. Thank you for showing how to do the triangle star. I also want to thank you for the tip of a small scrap of material at the beginning and end of stitching triangle points. You saved me and my material.😊 I did see the 18 triangles in the table runner! Yes! I see the 18 triangles. I have enjoyed blog hopping and am excited about your new book. I certainly do see the 18 triangles! This block and book are amazing. Thanks for the opportunity to win! I think I see the 18. Yipes. What great ideas this book holds. Yep, I can see all 18...but only because you had me looking for them! So many great quilts in this book...would love to own it! I did see the triangles. However, I will tell you that it was a little tricky until I enlarged the picture and looked closely. Your quilting really made the stars pop. Thanks for the video tutorial. It makes it so much easier to spot the 18 triangle blocks. I'm intrigued by all the variations this block can create. Love the idea of planning the background. Yes, I see the triangles full of possibility.